Create a fantasy garden or a picturesque front lawn with the Large Amish Made Wishing Well taking center stage. 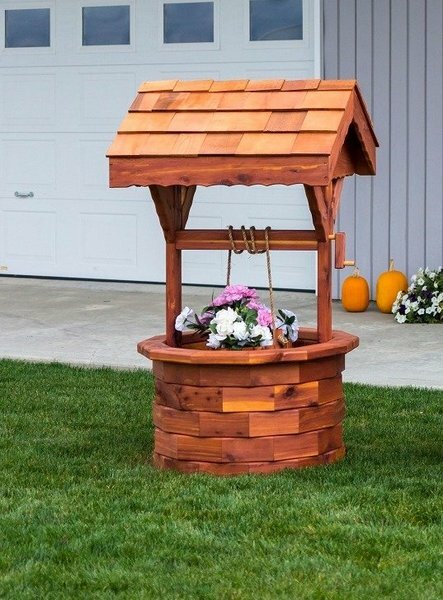 This grand wishing well stands 56" high and features a large cedar bucket that can be lowered and raised. Display colorful plants in your wishing well to enhance the look of your peaceful outdoor scene. This Amish made outdoor furniture is made of aromatic red cedar wood. Red cedar is a brownish-red color and naturally resists decay, making it an ideal candidate for outdoor wooden furniture. The fresh cedar scent repels bugs and offers a strength you can count on for your outdoor furniture. Browse our collection of Wishing Wells to find the one that's perfect for your home. An attractive wishing well or lighthouse adds an ideal spot to take family photos and also offers a landmark that's easy to identify when friends and family come to visit. Children will be drawn to this Amish Wishing Well to exchange wishes they are hoping for. Draw attention to your gorgeous rose bushes with a wishing well highlighting the space nearby. This outdoor Amish furniture adds the perfect lawn or garden ornament to your outdoor decor. Inside Height (top to bottom): 20"
Hi Stacey – My wishing well arrived today and it’s gorgeous! Please thank Dutch Crafters, and feel free to share the attached “before & after” pictures! My wife is SUPER happy!